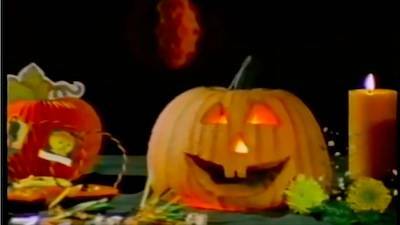 Halloween is my favorite time of year and what could have been more appropriate than for me to look back at one of the scariest Disney movies (or shorts?) ever. Of course, I’m talking about The Legend of Sleepy Hollow. 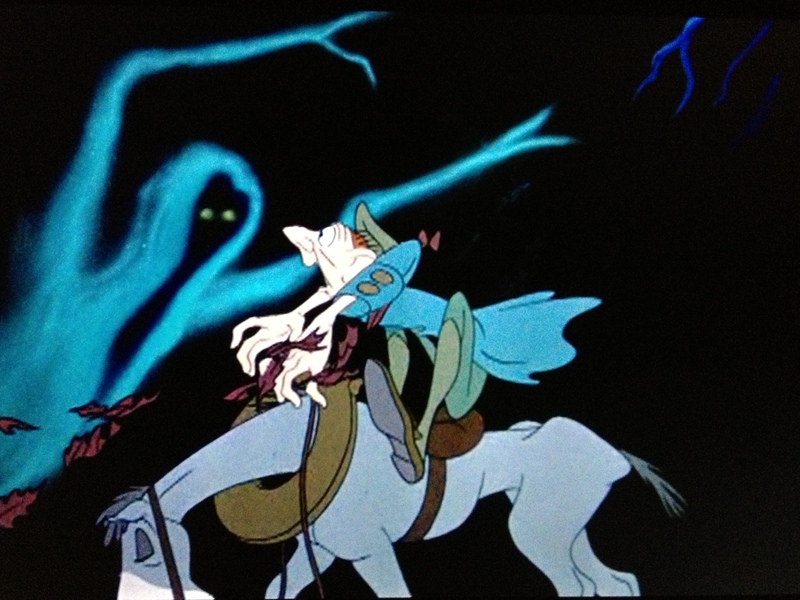 For as long as I can remember, I’ve always had some affection for Disney’s version of The Legend of Sleepy Hollow. What I like about it is that besides including some funny moments, Disney keeps the movie pretty intense once the horseman arrives. In fact, I would consider this cartoon a horror movie! Sure there are funny moments, as well as some musical numbers, and its… well… a Disney cartoon, but the movie is still pretty intense (for younger viewers). In fact, I would consider those later funny moments welcome releases to the scares and tension (similar to what you sometimes find in horror movies). Because it’s a cartoon, it’s still thought of as a kid’s movie (hence why I’m including it on my list of Creepy Kid’s Movies), but I think if it was remade as a shot-for-shot live-action movie today, the sensor board would not be giving it a “G” rating and might deem it too intense for children. Sure, the funny moments come more often then what you’d find in a horror movie, and are a little goofy, but the scary moments are still very effective (especially if you’re kid) and those moments leave a lasting impression with you. 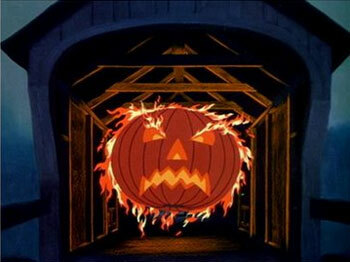 Even though The Legend of Sleepy Hollow was released with The Wind and the Willows as part of the animated feature film The Adventures of Ichabod and Mr. Toad, I remember seeing most of The Legend of Sleepy Hollow on Halloween specials that Disney would put out on TV as part of The Magical World of Disney, specifically in the special Disney’s Halloween Treat (a special hosted by a talking pumpkin that showed clips of “scary” moments from Disney cartoons and that concluded with the last 15 minutes of The Legend of Sleepy Hollow). My parents taped the special, so I used to watch it all the time as a kid. 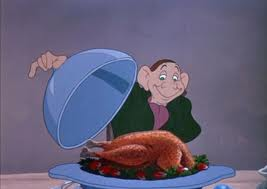 However, what I forgot about was that even though Ichabod Crane was drawn as a skinny man with a big nose and big ears (appearing like the awkward “hero” of many cartoons), he is actually not the “good guy” in the movie. Ichabod is the new schoolmaster, who is described as a “lady’s man” who favors students who have mothers that are good cooks. Then, when he seems to fall in love with Katrina van Tassel, the narrator reveals that Katrina’s father is the richest man in the village and that Ichabod is really interested in marrying the girl so that he could get her family’s land and fortune for himself. 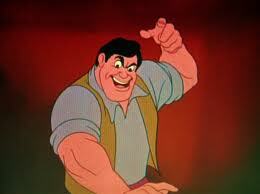 In addition, the other man fighting for the Katrina’s affection is Brom Bones. 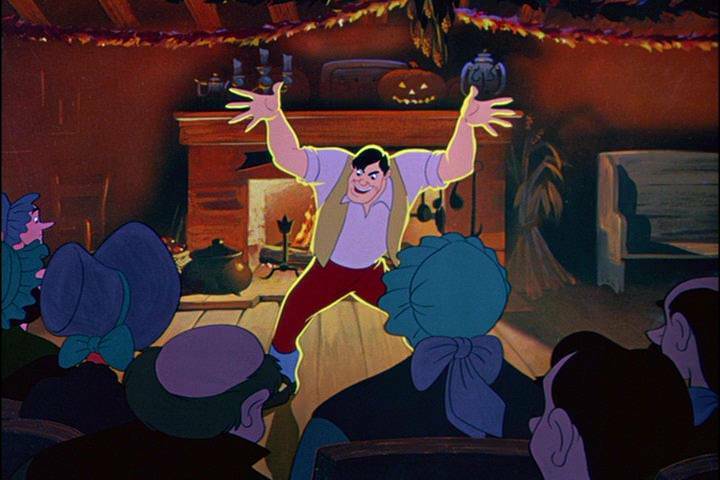 He is depicted as burly man who likes to play pranks on people, but whom the narrator describes as the town’s “hero.” He attempts to bully Ichabod, but, surprisingly, things don’t seem to go his way. Just by the way the characters look, you would expect Ichabod to be the innocent “nerd” who is being bullied by the popular Brom Bones until Ichabod eventually overcomes everything (especially since Brom’s name is “Bones”). However, Brom is the one who often loses out. 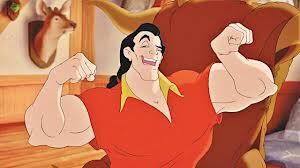 It’s also surprising because those watching the movie now can see some resemblance to Beauty and the Beast’s bad guy, Gaston. So, for a kid not listening closely to the narration or, like me, seeing only the second half of the movie, you would think that Ichabod is the “hero” of the movie and it is quite a shock when things don’t turn out so well for him in the end. Now, the whole movie (I’m calling it a “movie” even though its only about 30 minutes long and is part of The Adventures of Ichabod and Mr. Toad) is good, but the I can see how kids today might not like the first half due to the slow-ish pace and older-sounding songs (I still like it though), but once Ichabod and Brom go to the village Halloween party near the halfway point of the story, that’s when things really pick up. Brom and Ichabod fight over getting the chance to dance with Katrina (during which Brom again loses out to Ichabod). As a result, Brom gets the idea to tell a ghost story in an attempt to scare the schoolmaster. This story is told in song, sung by the great Bing Crosby. It’s an old 40’s swing-sounding song, but it’s catchy and I think it still holds up. I’m actually surprised no band covered the song during the swing-band recurrence that happened in the late 1990s (although, I could be wrong). I know it was covered by a couple of people, including Kay Starr and Bing Crosby, himself, but the version of the song, “The Headless Horseman,” that appears in the movie is quite creepy, as well as fun at the same time. The combination of the images with the song help to make the scene both creepy and fun at the same time. Plus, its fun to watch Ichabod attempt to play it cool, all the while he his is visibly shaken and entirely creeped out. Well, the story/song does its job because once Ichabod leaves the party and is riding his horse home through the dark woods, he appears nervous and is spooked by almost everything he sees and hears. 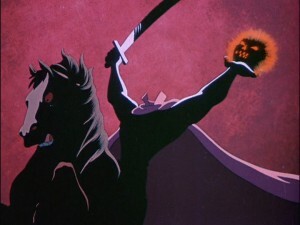 However, just when he laughs at himself about how scared he was, that is when the Headless Horseman arrives! What follows is a pretty intense chase through the woods. Sure there are a lot of funny moments as Ichabod gets turned around, knocked off his horse, and knocked around, but the movie never lets up on the suspense as you anxiously want to see Ichabod reach the bridge as he remembers what Brom Bones said, “Once you reach the bridge, my friend, the ghost is through, his power ends.” However, Ichabod is in for a surprise once he reaches that bridge. What’s interesting is that people often picture the Headless Horseman as carrying a jack-o’-lantern for a head, but the original story (from what I can tell) explains that Ichabod believes that the Horseman is riding around Sleepy Hollow “with his severed head resting upon the pommel of his saddle.” It’s only at the end when the narrator describes the broken pumpkin on the road near Ichabod’s hat does the reader realize that what the Horseman actually held was a jack-o’-lantern. What’s also interesting is that the story states that Brom Bones looks “exceedingly knowing whenever the story of Ichabod was related” and goes on to suggest that Brom Bones (a stunt rider) was the Horseman and scared Ichabod off. However, the ending is left open to interpretation with the statement that others in the town believe that Ichabod was “spirited away by supernatural means.” So, what’s surprising is that Disney’s version of the story leans more toward the supernatural ending. 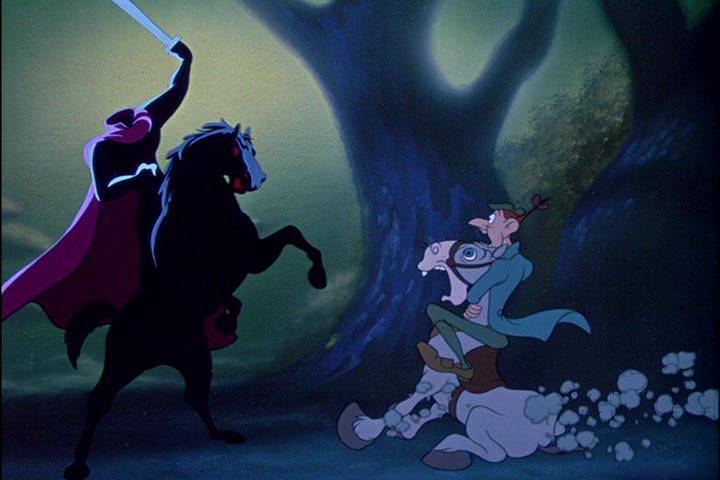 During the chase, Ichabod even ends up on the same horse as the Headless Horseman and is so close that he is even able to look down the Horseman’s shirt and see that the Horseman, in fact, has no head. In addition, the comments about Brom Bones seeming to be “exceedingly knowing” whenever he hears the story of Ichabod or even laughing when he hears comments made about a pumpkin being found at the scene are not in the Disney version. Instead, the movie ends with a comment about how the wives in town believe that Ichabod was spirited away by the Headless Horseman and then the movie cuts to a scene of the Headless Horseman laughing manically. Now, if the Horseman was Brom Bones, there would be no need for him to dress up like the Horseman again after Ichabod allegedly left town. So, this last scene seems to suggest that the Horseman is real and still out there looking for another head! The movie is a whole lot of fun! This entry was posted in Creepy Kids' Movies, Legend of Sleepy Hollow and tagged Brom Bones, Creepy Kids' Movies, Disney, Headless Horseman, Ichabod Crane, Legend of Sleepy Hollow, Sleepy Hollow by timothyheinz. Bookmark the permalink. I hadn’t seen this article until now so forgive me but thanks for your wonderful post and love for the Modern Mouse article I wrote!